In prior posts, I have mentioned that I find looking for compositions during urban photographing quite similar to composing while doing nature photography. At that time, I was speaking about looking for graphic lines and shapes when making abstract images. Those posts can be seen here and here. I think other similarities exist as well. One of these similarities is the importance of looking for and being aware of the smaller details; akin to 'the intimate landscape'. 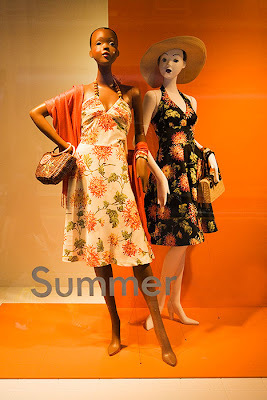 For example, as I was walking around town, I began to notice that some of the department store window displays were quite interesting looking and I began taking shots of those that appealed to me. When photographing windows like this, it is a bit of a challenge to get an angle that avoids glare and reflections off the glass, yet still allows for an interesting composition. I thought this particular display had a rather 'hip' feel to it. So, when walking around town, it's nice to have a camera handy and important to keep an eye on the small stuff as well as the skyscrapers!